Mitsuboshi Pale Ale is an English style pale ale brewed by Morita Kinshachi Brewery out of Nagoya. 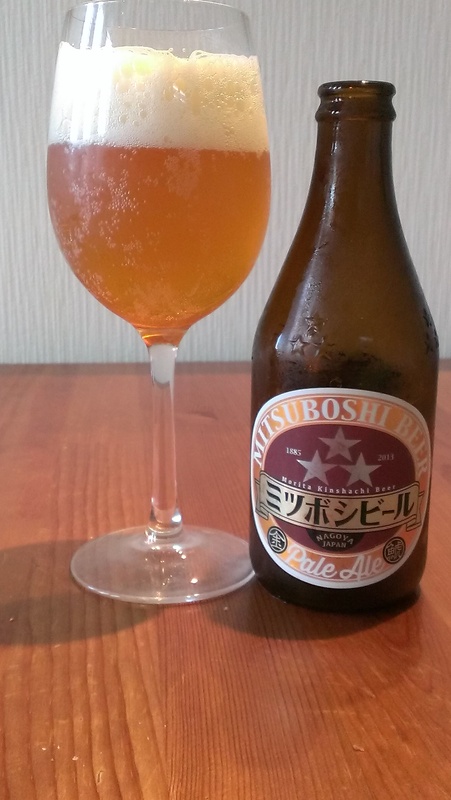 Mitsuboshi Pale Ale is based on a 19th century recipe for a style of beer that was popular under the three star brand. Brewed in a top-fermented style, so the yeast is at the top of the beer rather than at the bottom, Mitsuboshi Pale Ale is looking to reintroduce the style from yesteryear. Apologies to regular readers, but I used a wine glass for this beer to get some aromas going. Mitsuboshi Pale Ale pours well with a thin sized head once settled down and the head seems to do a good job in either hiding the aroma of the beer or completely masking it. Compared to other pale ales, such as Rising Sun Pale Ale, there seems to be very little aroma off this beer. The aroma I could manage to get off Mitsuboshi Pale Ale was malty with a musky smell; the mouldy kind of musky smell. Had they used yeast from the 19th century to make this beer perhaps? The body was a hazy golden colour, with some slight carbonation from the bottom. Thankfully the taste is slightly easier to than the aroma to write about as Mitsuboshi Pale Ale has a caramel – perhaps toffee – flavour to it and is also fairly malty as well. Some citrus flavours too, with orange and lemon being the most noticeable but the beer tasted a little “dirty”, if a beer can be described as “dirty”. If beer in the 19th century tasted like Mitsuboshi Pale Ale, then no wonder people gave up on craft beer. I can’t really recommend this beer to anyone, besides for the authentic taste of history. I think that its taste is rather pale – not what I would expect from a Pale Ale though. It is a mild beer, maybe a pilsner? Or a lager? Not an IPA. Mitsuboshi is the more exensive brand of Morita Kinshachi beer (generally selling for 515 incl. tax in most shops for a small bottle) and has some good beer, but the IPA cannot be recommended.